What started off as one woman and a pair of clippers, turned into three friends, a grandson, and a public “shave off”. In a show of solidarity for her mother and Sweet Louise Member Lynne, Meredith Priscott decided to shave her hair off. 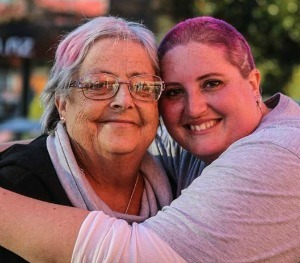 “It all came from my mum starting chemotherapy again after two years, and despite being told she wouldn’t lose her hair, she started to feel ‘that tingle’. I told her I would shave my hair to support her,” says Meredith. Meredith’s teenage son Ryan and friends Bronnie and Natalie wanted to show their support too and joined Meredith in shaving their hair off and fundraising for Sweet Louise, raising almost $850. The group raised money through their Givealittle fundraising page and also on the day of the head shave at The Warehouse, Te Awamutu. She’s really happy that the money they raised will give four members and their families a special day of creating memories that will help through the hard times. Your support helps our members to live as positively as they can for as long as possible. Thank you.